Nevis’ Deputy Premier Alexis Jeffers. 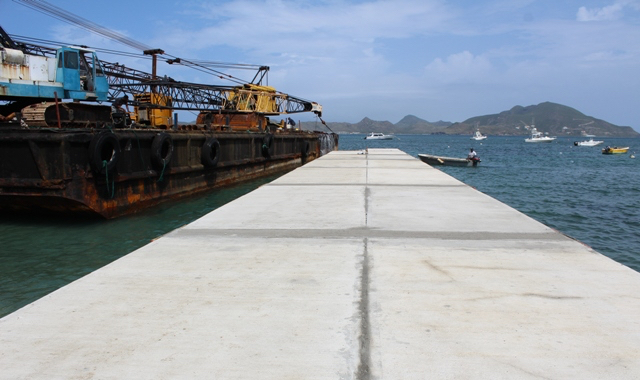 Basseterre, St. Kitts, 30th January, 2019 (MyVueNews.com) – A new pier under construction at Oualie Bay, Nevis, will provide a high level of security and comfort to persons taking water taxis between Nevis and St. Kitts, said Deputy Premier of Nevis, Alexis Jeffers. In addition, the pier also will make it easier for water taxi operators to dock and transfer passengers, the Deputy Premier said, as he toured the work at Oualie. 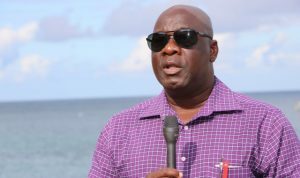 In a House of Assembly session late last year, it was noted that the existing pier being used is in a state of disrepair having suffered damage during previous hurricane seasons. Jeffers indicated that the damage presents safety issues for persons using the facility. But after some work stoppage in 2018 to deal with emerging issues, Jeffers provided details of the expanded new pier. The project will cost $6 million, funded from SIDF resources, and will include a reception area, as well as parking spaces.